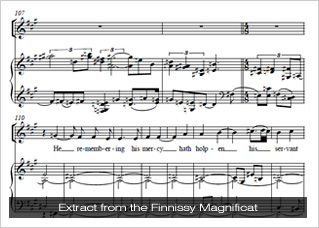 quite intensively on the score with Professor Finnissy during the summer, and as soon as the boys started work on the score, it was clear that the boy choristers really relished the fresh challenges of this highly distinctive setting: extract attached. The Composer was present for some of the afternoon’s rehearsal (photograph below), and it was a real pleasure for all present to work together so closely on bringing about the exact textures and effects demanded by the piece. It seems that all this hard work paid off! 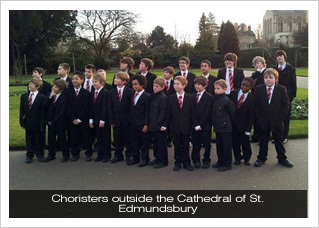 The composer wrote a few days after the performance, commenting on how he was ‘still glowing with the Bury St Edmunds experience’ – as were the boys – and thanking the choristers ‘for such a terrific performance’. 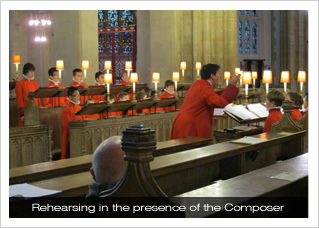 Even members of the public were impressed, as a completely unsolicited email arrived into the Director of Music’s inbox before the choir had even made it back to Northampton, thanking the choir ‘for their excellent performance and contribution to Evensong this evening’, and saying how much he was hoping for a return visit by ‘your excellent choir in the future’. Many congratulations to all involved, and here’s to the first mainland European premiere as part of the boys’ tour of Northern Europe!